Pressure happens. Air pressure and vapor pressure happens to houses. Like vapor management, air pressure management is critical for air tight houses as well as those with combustion appliances in them. Air pressure differences across the shell (between conditioned spaces and their surroundings) affect health, safety, and durability of the building enclosure. The same is true as between areas in the house. Air leaky houses don’t usually have air pressure balance issues, but they have a lot of other ones we’re trying solve. Improving energy performance requires air sealing. Tight or partially tight houses can have pressure balance issues. A house can be depressurized. It can be depressurized by . . .
– Exhausting indoor air through the attic. – Fans: bath area fans, rangehoods, dryers, air handlers, and fresh air ventilation. Interior depressurization can have a big impact on combustion appliances and fireplaces. It also pulls unconditioned outdoor air in. Hot air rises. Hot attic air pulls air through eaves and holes in the ceiling. Air escaping through the attic pulls air in through walls and from the basement or crawlspace. This pressure is stronger in winter than summer. To stop this air flow (you’ll never stop the pressure), the air barrier is sealed. When combustion appliances are present, it’s important to seal the ceiling first. Otherwise, the harder pull from the attic may backdraft them. For a variety of reasons, the ceiling is usually air sealed first. It’s important to keep indoor moisture out of the attic. This is more important in colder regions of the country. A goal is to seal up the house tighter than a submarine and add mechanical ventilation. The tighter the house, the better the ventilation systems work. Pressurizing and depressurizing the house is a good thing. However, it has to be managed carefully around combustion appliances. Another major source of air pressure on the house is wind trying to flow around the house. Where it blows against the building, it pressurizes it. When the wind finally gets around the house, it depressurizes the other side. It’s a common practice to avoid installing a return air duct in every room that goes back to the air handler unit. What usually happens is affected rooms are not modified to allow air to circulate back to the air handler. Typically, supply air ducts only are put in bedrooms. This is by choice. Return air ducts aren’t put in several rooms of the house, by law: closet, bathroom, toilet room, kitchen, and mechanical room. How many of these rooms have doors? Without a return, when the door is shut, the room pressurizes when there is a supply air duct installed. The room fills up like a balloon. When it can’t be filled anymore, air is pushed out through holes in the wall. If the room is air tight, air doesn’t flow into the room at all. Unfortunately, the return air has to be made up from somewhere, so some other place in the house is depressurized. Normally, it pulls in air through the shell. The tighter the room though, the more it is depressurized. Rooms without returns would not be much of a problem if there were no doors. When the door is closed, the room is pressurized and some other place in the house is depressurized. If return ducts to the air handler are not installed for whatever reason, room relief is necessary. This is usually done with transfer grills or jumper ducts. There is some benefit by undercutting doors, but not enough to make up the difference. This can be done without compromising privacy. Closed doors often make a difference between basements and the rest of the house. Basements tend to be more air leaky than the living space. When the basement door is open, pressurization may not be an issue. However, as soon as the door it closed, the living space could become way more air tight. Pressure happens. However, it can’t be tolerated very well by typical gas water heaters, furnaces, and fireplaces. Pressure affects on them become more evident as the house gets tighter. Combustion safety is a major home performance concern. It should be evaluated as part of a diagnostic home energy audit. 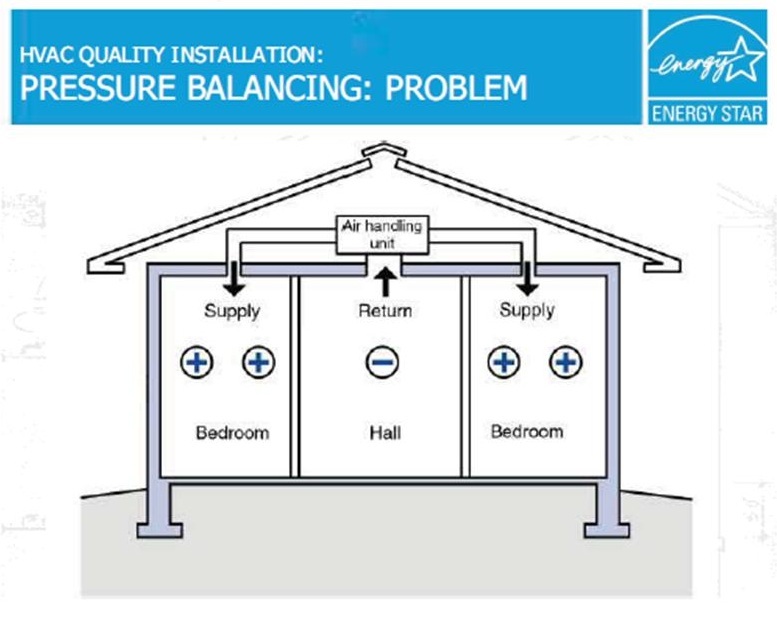 When there are pressure imbalances in the house due to mechanical ventilation, clothes drying, or heating & cooling, the internal balance needs to be corrected. Air sealing, duct sealing, insulating, and vapor management can change the pressure conditions in the house too. Therefore, it is critical to have your house reevaluated for combustion safety after any of these improvements are made. Backdrafting of fireplaces and combustion appliances simply cannot be tolerated. The pressure balance inside the house should be nearly neutral with respect to the inside at all times, under all conditions. For proper operation of mechanical ventilation, there has to be a pressure difference between inside and out. This pressure imbalance should be the same throughout the house. When combustion appliances are present, the pressure difference should not impact on their proper performance. Nothing can be done about the pressure experienced at the shell. No one can control wind and weather. However, air sealing and vapor management can minimize building deterioration by not allowing vapor to pass through the shell by air transport. It’s important to manage internal pressure to avoid air infiltration and exfiltration, especially from crawlspaces. Ideally, the pressure difference between inside and out is near zero, just like it is with an air leaky house. Mechanical ventilation works well only when there is a pressure difference between inside and out. Therefore, it’s unrealistic to expect a tight house be at neutral pressure with respect to outside at all times. Continuous mechanical fresh-air ventilation is the best answer now for air tight houses and will be better in the future.